Write and publish articles in a space you controlincluding locally, offline and static hosting. Save articles to your personal datastore and edit (supports Solid / Linked Data Platform). Annotate, reply to and share articles.Let your readers choose where to store their annotations. Get notificationswhen someone interacts with your article. Embed live data, scripts, stats and multimedia.Great for tutorials and experimental results. Add identifiers and semantic markup to any conceptto put your prose in the Linked Open Data cloud. Anyone can tweak, clone and remix your articles.Spread your ideas, facilitate knowledge access and reuse. Let your readers choose a view that suits them.Design your own or use preset themes. Open source and under ongoing development...dogfooding, feedback and contributions welcome. Try it now!This webpage is a dokieli article. You can download the dependencies to work offline, or use them directly from dokie.li. Use in-browser local storage to save your changes or export to save to your harddrive, and to any Web server when you’re ready to share your article. In order to edit articles in the browser and save directly to server storage, as well as grant access to collaborators to edit, dokieli can communicate with Solid-like platforms, based on the Linked Data Platform W3C standard. This is essentially a REST API for reading and writing Linked Data. Solid includes identity through WebID, access control through Web Access Control, and other enhancements for decentralised personal data management. You can store dokieli articles in a personal online data store, privately or publicly (or limited access to others with WebIDs), as well as use this space for annotations and notifications (and data generated by other applications). dokieli implements the W3C Web Annotation specifications Wherever your article is published, readers can leave annotations and replies if they have their own personal datastore to save them to. If your article is published on a personal storage space, you can offer to store annotations and replies on their behalf, and enable anonymous responses too. All annotations and replies can be saved with a Creative Commons license. 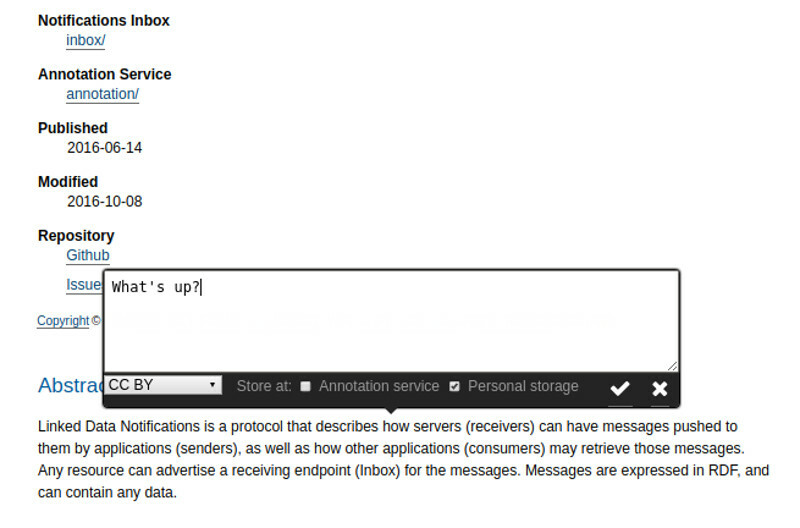 dokieli is also able to send and consume information from a profile's outbox as per W3C ActivityPub. 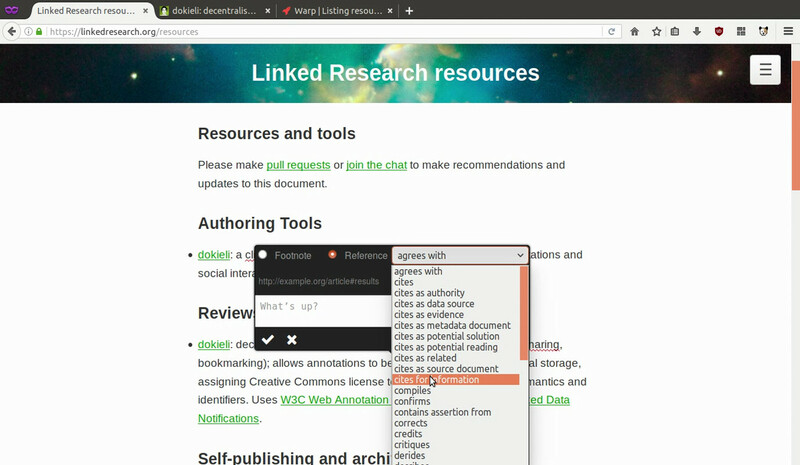 dokieli implements Linked Data Notifications W3C Recommendation for notifications for annotations and social activities. 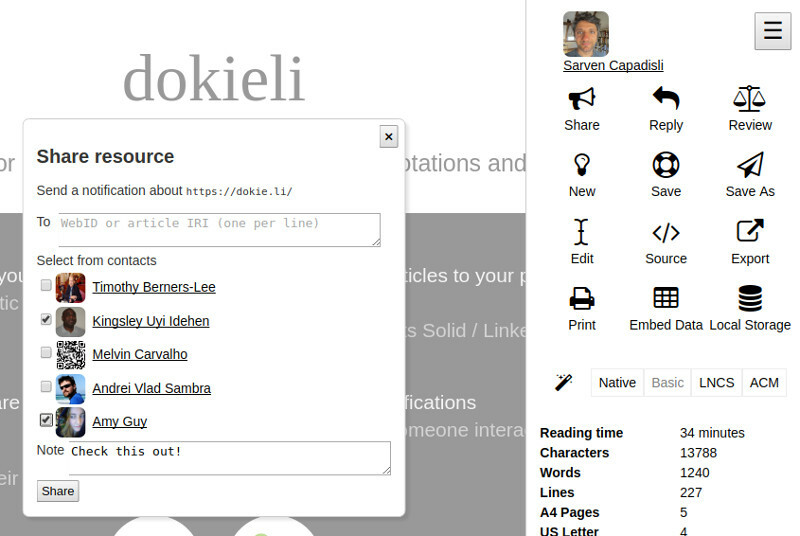 Whenever someone interacts with your article through dokieli, you will receive a notification in the appropriate inbox . Right now you get notifications for annotations, replies, shares, reviews, citations/links, bookmarks and likes. dokieli also implements the W3C Activity Vocabulary. A dokieli article is simply an HTML document, so anything you can include in an HTML page you can include in your article. We’re adding new features to the UI to help with this all the time. You can directly embed raw data; in Turtle, JSON-LD, or TriG (used in Nanopublications). Unique identifiers (URIs) are automatically generated for every section of your article to make it easy for others to link and refer to them. You can add identifiers to any concepts you think are important at any level of granularity. Additionally, you can add descriptive markup to any concept or snippet of prose which has an identifier; dokieli generates RDFa markup under the hood so your ideas are exposed as Linked Data for others to query, reuse and visualise. Readers can click save as on any of your articles to create a copy in their own datastore. This copy retains a link back to yours as a derivative work. This feature means that dokieli is a self-replicating application, spreading itself around the Web as ideas and discussions are spread. Views are just stylesheets, so if you know CSS it is easy to make your own or customise our presets. You choose which to include with any of your articles according to what you think is useful for your audience, whether that is your personal website style or an academic paper layout. Every so often we add a new view, so keep an eye out. dokieli envisions research results, analysis and data all being produced interactively on the Web and seamlessly linked to and from articles. Through annotations and notifications, the academic process of peer-review can be open, transparent and decentralised for researchers. This is in line with the goals of the Linked Research initiative. As an increasing number of conferences are accepting HTML submissions, you can write your paper with dokieli and export to HTML or PDF for submission; we provide stylesheets for LNCS and ACM publication layouts out of the box. Here is one article, about dokieli, and others in the wild. dokieli is open source; developers can find the code at github.com/linkeddata/dokieli. This is very much a work in progress, so contributions, issues, bug reports and feature requests are welcome. You can also join the chat on Gitter. We’re building dokieli to be something we want to use, so we encourage dogfooding! Check out examples in the wild. This page itself is a dokieli document, so to get started, open the menu in the top right and click edit. You can change this page to your heart’s content, try out different views, then export the HTML and upload it somewhere you control. If you have a personal storage space, you can click new (for a blank document) or save as (for a copy of this one) and choose where you would like to save it. You will be redirected to your new document, where you can edit away and have changes automatically saved to your Webspace. Of course, you’ll also be able to interact with your new document using other applications! dokieli (issues, chat), Linked Research, Solid. Supported by Crosscloud (2015-10 — 2016-09).